The NCLEX RN exam plays a huge role in your medical/nursing career future and a huge role in your future as a whole. The NCLEX has many different options for test preparation books, all-in-one review guides to question and answer books. The NCLEX, or the National Council Licensure Examination, is a very difficult exam, and has a big say on your nursing future. 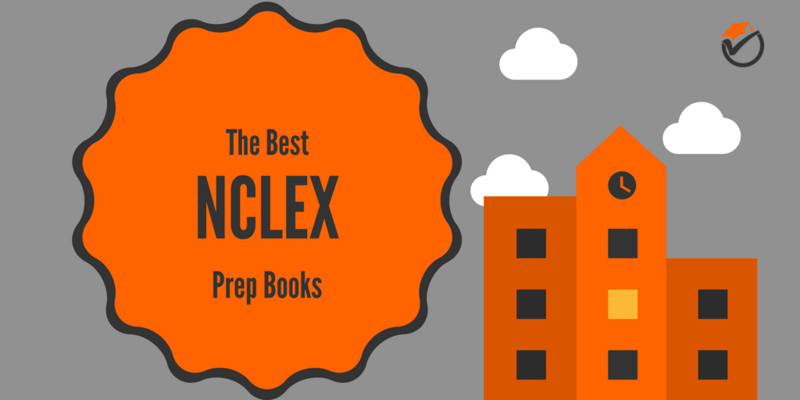 Because of these reasons I have created this list of the best NCLEX prep books. All of the info below should make it very easy to choose which all-in-one guide or question-and-answer book is best for you to become a registered nurse with a nursing license. Saunders Comprehensive Review for the NCLEX-RN is our best overall study guide for our list of the best NCLEX RN prep books. The review sections for Saunders Comprehensive are very comprehensive and in-depth, given its 1152 pages. This gives you confidence on test day that you won't be surprised with new material that you have not studied for since all of it is included in this guide. The answer explanations are also very detailed and thorough. You will never be left scratching your head wondering why you got a question wrong while studying. These explanations will also help you to learn through your mistakes, which is always an advantage. There are also plenty of practice questions to make sure that you get those repetitions in before the test. The better you prepare, the higher your score on test day will be. The one main flaw of this study guide is that some of the sample questions are a little too easy. This may leave you overconfident for your exam and may give you a nasty surprise when you get more difficult questions on exam day. The positive thing is that these types of questions are few and far between. 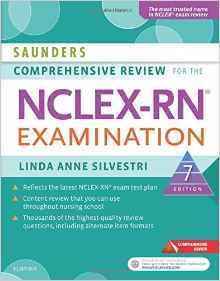 Saunders Comprehensive Review for the NCLEX-RN is our best overall study guide on our list of the top rated NCLEX review books. HESI Comprehensive Review for the NCLEX-RN is our number 2 overall study guide on our list of the top NCLEX review guides. The summary green boxes included in this study guide are great for focusing on what you really need to know for the test. These green boxes really allow you to pin down the most important things to study, saving you time (hopefully enough time to go on a Starbucks run during that late night study session!). If you need more detail you can read the review sections and the corresponding chapters. Also, the consistent format and chapter organizations make it easy to move between topics while reviewing. This allows you to study for long periods of time without becoming tired or frustrated. The main thing that I dislike about HESI Comprehensive Review is that it contains a little too much review and not enough practice questions. This study guide may be good for someone that really needs a refresher of the topics that they learned during their nursing classes, but does not give enough practice questions to really get into what you will see on test day. 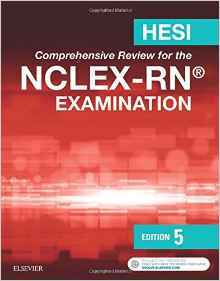 HESI Comprehensive Review for the NCLEX-RN is our second best overall study guide on our list of the best study guides to prepare for the NCLEX RN. Lippincott Q&A Review for NCLEX-RN is our third best overall and best value pick for the top NCLEX study book. Unlike our previous pick, this prep book is very much focuses on practice questions instead of reviewing subjects. There are tons and tons of practice questions. We would be shocked if you see a question on exam day that you are totally surprised by. This confidence really leaves you at ease knowing that you won't see something out of the ordinary on test day. The study guide also has logical organization and flow. The book makes you progress from easier to more difficult questions. This makes it really easy to ramp up your studying and to ramp up your score on test day. 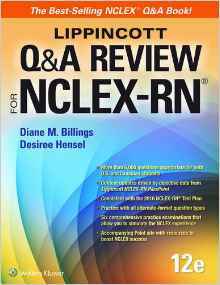 One weakness of Lippincott Q&A Review for NCLEX-RN is that a few categories such as leadership and management are not introduced as topics. However, the questions for these topics are included separately under other subjects, which somewhat makes up for it. If you are looking for something that has lot of sample questions instead of subject reviews, Lippincott Q&A Review for NCLEX-RN would be the best choice for you. 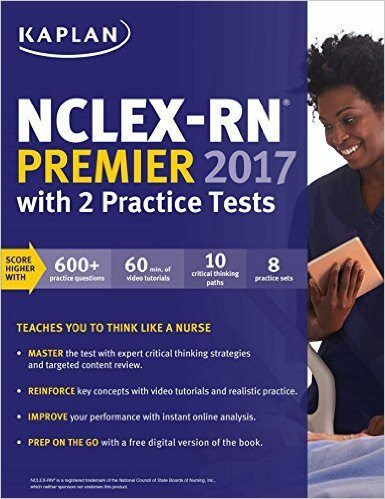 Kaplan NCLEX-RN Premier is our 4th best study guide on our list of the top rated NCLEX preparation books. The chapters are broken down into easy lessons, allowing you to pick it up and study for short periods of time. This really allows you to fit in studying on a busy students’ schedule, especially in between classes. Another positive is that the practice question difficulty is similar to that of what you will see on the actual exam. This really gives you a good feeling on exam day knowing that you won't be scratching your head because the questions are a lot more difficult than you have seen before. The 1 main flaw of Kaplan NCLEX-RN Premier is that it is a little bit less focused on reviewing the topics and a little bit more focused on just general test-taking strategy. The questions on the actual exam are a lot more geared towards subject knowledge rather than strategies. Kaplan NCLEX-RN Premier is our fourth best overall study guide on our list of the best NCLEX study guides. NCLEX-RN Practice Questions Exam Cram is our 5th best overall and budget pick for the top NCLEX prep book. The quick reference sheets included within the book really allow you to study quickly and save time. Also the separate quick look up answer and rationale pages allow you to speed through the practice test questions. If you're confident on a question then you can quickly look up the answer, but if you got it incorrect or were confused, you can look at the rationale pages. This allows you to spend more time on the questions that are difficult and less time on the ones that are easy, making your study time much more efficient. One weakness of NCLEX-RN Practice Questions Exam Cram is that some of the answer references have editing errors or are incorrect. This leaves you sometimes confused and wasting time wondering why you got a question wrong when it was really right. Also, since NCLEX-RN Practice Questions Exam Cram is geared a lot more towards practice questions, it is extremely brief on concept overview. You may need to purchase another guide if you're looking for a more comprehensive subject review. NCLEX-RN Practice Questions Exam Cram is our fifth best overall and budget pick for the best NCLEX prep guides. Our suggestions offer the most cost effective way to study for the NCLEX exam without breaking the bank. Our list includes guides that are either focused on concept review or practice questions, with our top two choices focusing on both. We know that not everyone has the same nursing degree, whether it be an associates in nursing, a bachelors of science in nursing or a Doctor of nursing. The NCLEX allows you to start your nursing career and puts a cap on your nursing school and nursing education. Buy Saunders Comprehensive Review for the NCLEX-RN if you are looking for the best overall study guide and do not care about price. 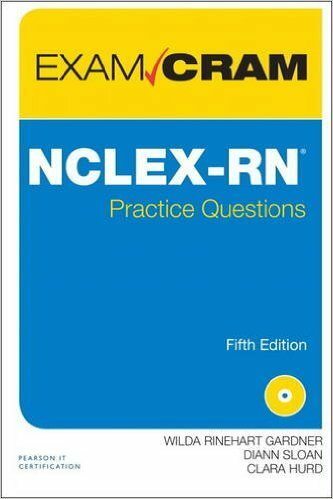 If you are looking for looking for a lot of practice questions and a lower price, pick up Lippincott Q&A Review for NCLEX-RN.